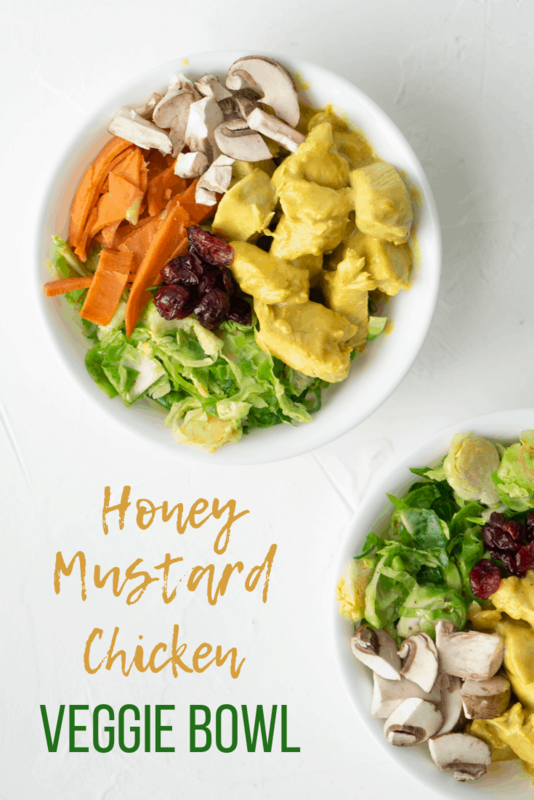 As the weather has gotten colder, I’ve been craving a big bowl of warm veggies and chicken, so when I realized that Sir Kensington’s recently came out with a new honey mustard sauce, I knew exactly what I would be making with it. There really wasn’t much to add in terms of the coating for the chicken, and I simply added a little oil for cooking, garlic, salt, and pepper. VOILA. 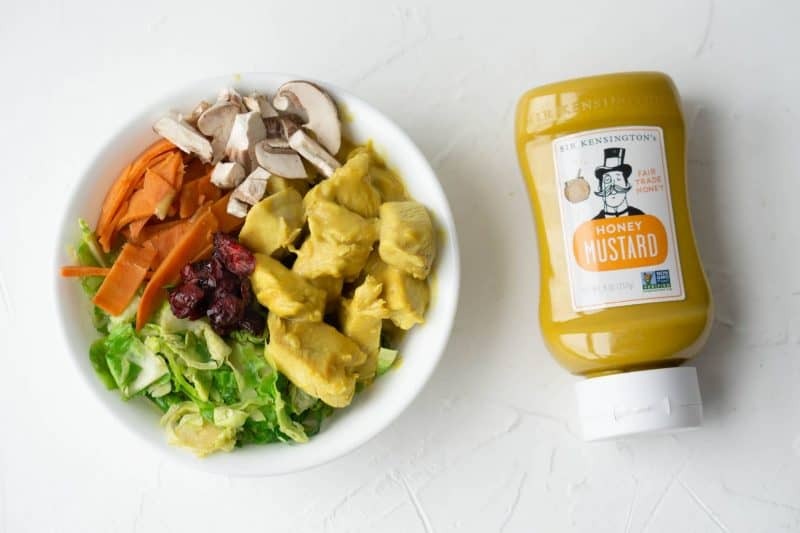 The honey mustard is made with simple, non-GMO ingredients (including fair trade honey), and tastes pretty delicious as is. As I make sure to mention in virtually all of my recipe posts, I’m not one for complicated recipes, so if I was able to buy veggies pre-cut or shredded, I did. (Thank you Trader Joe’s). I highly suggest taking a shortcut sometimes when making meals. Feel free to use whatever veggies you want in your bowl, but these ones were calling me when I went to the store. Also speaking of stores, this honey mustard is not in every store yet, so if you can’t find it by you, you can order it (and their other products) from the newly launched Sir Kensington’s Amazon store here. Let me know what veggies you would use in your bowl! 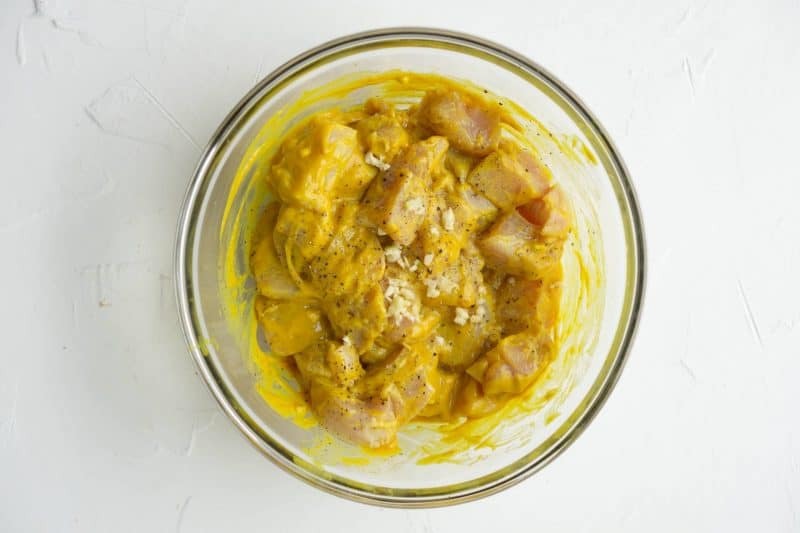 Cut chicken breasts into 1-inch cubes and place into a large bowl. Add minced garlic, olive oil, mustard, and salt and pepper and coat thoroughly. Set aside. If you are not using pre-cut sweet potato, peel and cut 1 sweet potato to your liking and place in a bowl. Add a small amount of water, loosely cover, and microwave 4-5 minutes until potatoes are fork tender. While the sweet potato is cooking, heat a large saute pan over medium heat and add the shredded Brussels sprouts plus a pinch of salt and pepper. Saute for about 2-3 min or until the color becomes bright green and they are slightly tender. Remove from heat and set aside. Add chicken to large pan and spread out, making sure the cubes are in an even layer. Cook for approx 10 min, flipping chicken as it cooks to make sure both sides are evenly cooked through. Check to see if it is done by removing a larger piece and cutting in two. 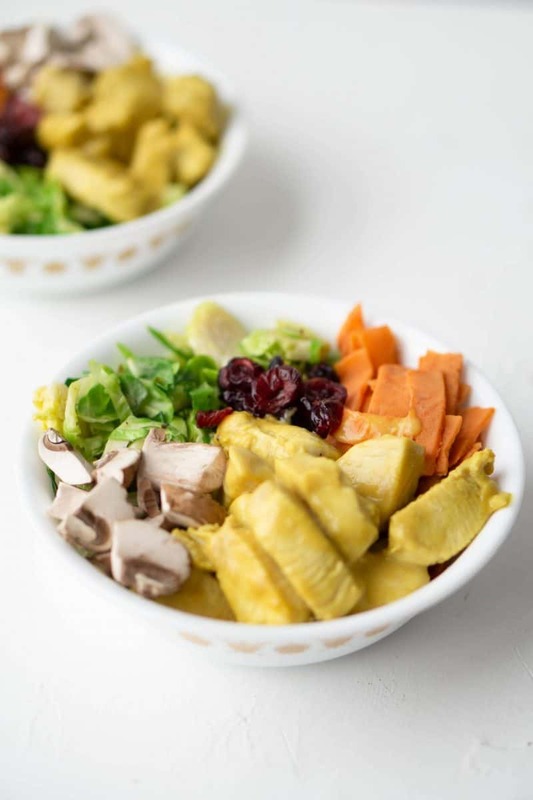 Once the chicken is done, remove from heat and combine into a bowl with cooked Brussels sprouts, sweet potato, mushrooms, and garnish with a few dried cranberries. I love receiving your emails!